Justify has won the Triple Crown. He's the 13th horse to ever win all three races ... Kentucky Derby, Preakness, and the Belmont Stakes. Amazing! How do you calculate compound probability? Skip the betting odds and deal only with the odds that one horse could win 3 amazing races. June 9th is the Belmont Stakes race ... the last race in the Triple Crown. 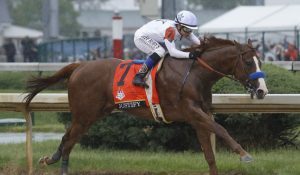 Can Justify beat the odds? Check out our Will Justify win the Triple Crown? which explores the math and the ins and outs of the Triple Crown. ← Will Damarious Randall have to pay big?